Okay, settle down. I looked into it, and it turns out that hypnosis is actually a real thing. I mean, there’s stage hypnosis, which is silly — that’s the magic show kind where they bring you up on stage and make you cluck like a chicken. That’s not real hypnosis. It’s just saying things, and then picking someone from the audience who looks like the kind of person who probably clucks like a chicken anyway. Then there’s hypnotherapy, which is a legitimate technique that can help a patient to relax and focus. It’s helpful for relieving chronic pain, anxiety, asthma, irritable bowel syndrome, bulimia, and other disorders that are amenable to a change in mood or outlook. The term was coined in the 1840s by a Scottish surgeon named James Braid, who developed the Eye-Fixation Hypnotic Induction Method that Julia used when she hypnotized Maggie at Windcliff Sanitarium. But it turns out you don’t need to wave a watch or a light at somebody. It’s possible to get the same effect just by helping them relax and focus. Braid was actually a very interesting and thoughtful guy, who studied and wrote about hypnotism as a helpful complementary therapy that could be used in conjunction with other conventional forms of medical care. Oh, and P.S. : It’s also possible to use hypnosis to record over a person’s memory, like it’s a cassette tape. That totally happens ALL THE TIME. 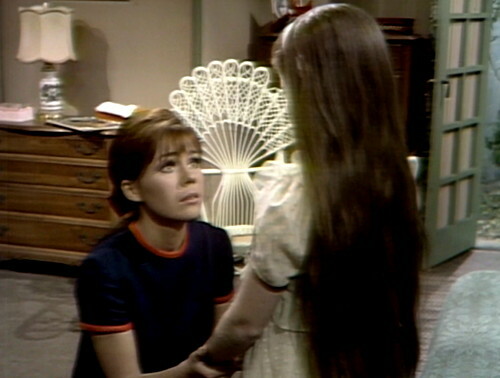 On Friday, Julia used her magic memory-erasing medallion to hypnotize Maggie and make her forget everything that happened when she was being held prisoner in Barnabas’ secret blood-slave dungeon. And as horrible and dehumanizing as that is, it did make Maggie feel better, and it’s actually possible at this point for her to go back to her job and her boyfriend, and just move on with her life. Now, I’m not saying that’s a realistic or desirable option for real-life victims of abuse, because real humans don’t have magic reset buttons in the back of their heads where you can just rewind over the trauma. But if this is a fictional universe that furnishes people with rewritable flash drives, then you have to admit that this is a more comfortable lifestyle than sitting in a sanitarium screaming the lyrics to “London Bridge”. So right now, the show is trying to figure out whether this story thread is over or not. Maggie, Joe and Sam are hanging around the house, recapping and not really making any decisions. Maggie keeps making closing statements like, “Well, the important thing is that wherever I was, I’m back, and everything is going to be just like it was.” There’s an opportunity here to just wrap everything up in a bow and go do something else, the way they did with the blackmail storyline a month ago. 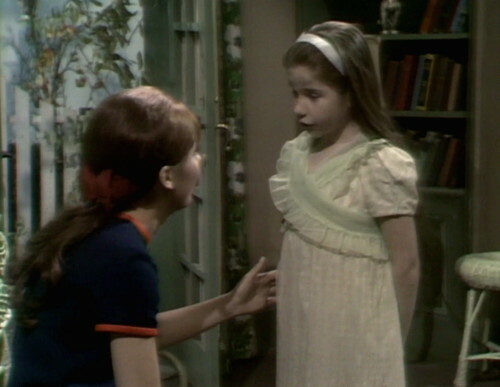 But then there’s Sarah, the weird little ghost girl who helped Maggie escape from the vampire’s dungeon, and then brought her home from the sanitarium. Sarah shows up every once in a while, and follows her own private ghost methodology that she appears to be inventing fresh every day to fit whatever lunatic plot contrivance that the writers need to create. It’s not clear whether Sarah actually has a plan to expose Barnabas as the vampire, and that question is going to get even more complicated over the next week or so. But for today, at least, she seems to be dropping in purely for a social call. She stands at the open French windows and watches Maggie read. Maggie looks up, and notices that she has a visitor. Maggie: I didn’t hear you come up. Sarah: I can be very quiet. Maggie: So, I see. Well, would you like to come in? And she strolls in, with a big smile. Sarah turns out to be one of those pleasant surprises that I’ve found as I’ve been writing these blog posts. I remembered her as being kind of annoying, especially because sometimes she forgets what she’s supposed to do, and she looks over to the director for instructions. But she’s really very good, and her occasional stumbles actually make her feel more like a real little girl. It’s easy to believe that she’s just wandered over to Maggie’s house to play. Meanwhile, Maggie is acting like a good-humored, friendly adult who’s meeting a strange child for the first time. Sarah: Are you feeling better now? Maggie: Why, yes, I am. Thank you. Sarah: I was worried about you. Maggie: Oh, that’s sweet of you. But don’t be worried, I’m fine. Sarah: Well… because you’re my very best friend. Maggie is touched, and puzzled. Sarah: Sarah. You act as if you don’t remember me. Maggie: Well, I’m sure I do, Sarah. But you’ll have to forgive me just now. My memory isn’t what it should be. Sarah wants to play catch and sing “London Bridge”, so Maggie plays with her for a couple of verses. Maggie: I haven’t sung that in quite a while. Sarah: But you sang it with me, lots of times! Maggie: I did? Well, now, when did I ever sing it with you? Sarah: When you were sad. I used to come and play with you, just like now. Maggie: Where did you see me? Sarah: In a room. You used to call me, and call me. The penny drops. Maggie bends down, and looks Sarah in the eyes. Maggie: Little girl… Sarah… Do you know anything about what happened to me? Sarah: Will you tell me the truth? Sarah: Do you remember me? Maggie: The honest truth? No, I don’t. Now, she’s not a great actress, and I’m not saying that she is. She’s nine years old and she has a strong Philadelphia accent, and sometimes it sounds like she’s learned her lines phonetically. But right now, she’s a nine year old kid whose best friend suddenly doesn’t recognize her. And it’s legitimately heartbreaking. Sarah is really important. She visited Maggie, and showed her how to escape, and told her father where to find her. Then she listened and concentrated for weeks, until she figured out where the sanitarium was, and then she helped Maggie escape from there, too. Sarah’s been faithful, and clever, and she truly believes that Maggie is her very best friend. So Maggie’s memory loss isn’t just a magic reset button that wraps up this story thread. Sarah feels hurt, and with good reason. It really feels like a betrayal. That’s not the end of the episode. 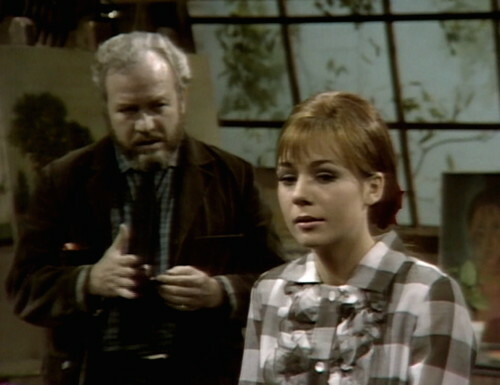 It’s actually only about halfway — next, Barnabas comes over and tries to figure out whether he should kill Maggie or not. 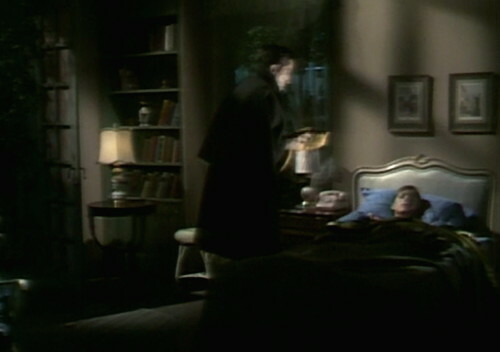 He even sneaks into Maggie’s room while she’s sleeping and prepares to suffocate her with a pillow. But that’s not important; it’s just plot mechanics. 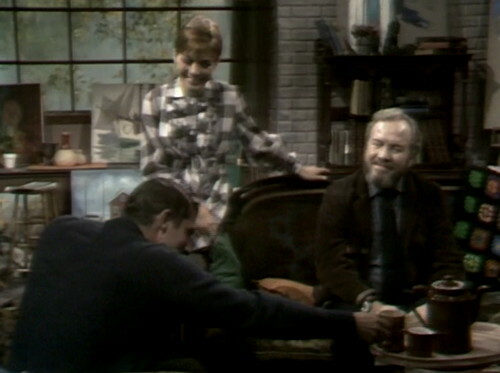 The important thing that happens in this episode is that Sarah is a lonely little girl who’s made one friend in the last hundred and fifty years, and Barnabas and Julia took her friend away. That was a very bad mistake. Sarah is pissed. There will be consequences. In the opening scene, Sam coughs loudly after he takes a sip of coffee. Yeah good episode, its cool how Sarah is alive for a ghost. It really was a brilliant move to make a confused, good-hearted, lonely ghost girl the only one with power over Barnabas. (And well, Julia, too). I also found the Maggie/Sarah scene kind of heartbreaking. Sam Evans is the worst coffee brewer in town! The java that Joe has seems to either be clear, or ‘pretend’ coffee. Incidentally, I think I like Joel Crothers better when he’s in color – mostly his wonderful grey-blue eyes. Maggie has a photo of herself on the bureau, unless it’s a headshot of that actress who looks just like her, Katherine Leigh Scott. In a couple of years, we’ll see Olivia Corey doing the same. All his otherworldly powers, and Barnabas is gonna just smother Maggie?